The facility is available to anyone for daily use, or you can become a member and receive additional benefits. Membership includes free access to aerobic and cardio classes, member-only hours, and free weight and cardio equipment orientation. Members also receive 10% of some sports and program registration fees. Monthly and annual memberships are available for individuals, couples, and families living at the same address. To become a member. Sign up Monday-Saturday at the Legacy Center front desk between 8 a.m. to 9 p.m. Select a pass type and complete the application. Pay your enrollment fee (monthly passes only). 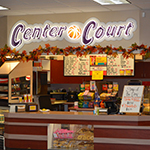 We have a wide variety of food at the Center Court snack bar that will satisfy the whole family’s appetite at a fair price! Our menu includes salads, soups, sandwiches, pizza, chicken strips, frozen yogurt, nachos and much, much more! Enjoy the benefits of working out without your kids! The Legacy Center day care is a clean and safe environment for any child. Our caring staff will keep your kids entertained with fun activities, coloring, puzzles, books, movies and fun!!! See flyer for pricing and hours. 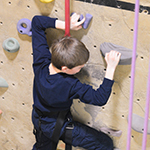 The Climbing Wall is open Monday, Wednesday, and Thursday from 5-9 p.m. It is also available for rent during alternative times for $40/hour. 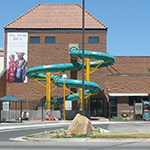 Participants must weigh at least 40 lbs and children under 8 must be accompanied by an adult. Closed toe shoes are required. See flyer. 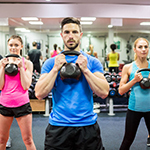 Cardio and weight room orientation is available the first Thursday of every month at 6 p.m. Make your workout less frustrating by attending this instructional class. It is free to members or $2.50 for non-members. Meet on the mezzanine area next to the weight room.